Ice Sculptures, What Do We Sculpt? So yes you found us. That’s right a full service wedding company offering emcees, DJ’s, photo booths, videography, photography and a full-service ice sculpting company. So you want to differentiate your event? Well you’ve come to the right place. First let’s start by educating you on the various types of ice sculptures that are out there. 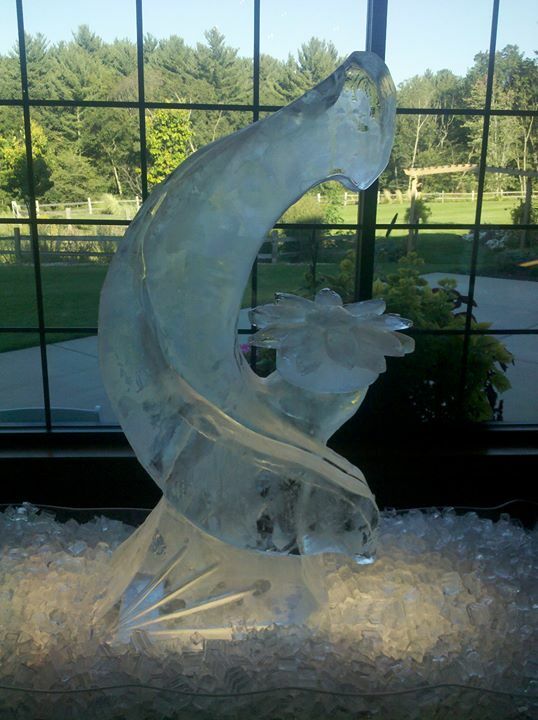 First there’s the standard Ice Sculpture. This piece will usually last 6-8 hours and progressively loses definition as time passes closer to the 6 hour mark. Client’s can choose from our ideas lists or give us an idea. We are only limited by your imagination. Next up is the Ice Luge. You might have seen something similar to an ice luge on your vacation to a warm tropical island in Mexico. For a wedding reception these can be fun. 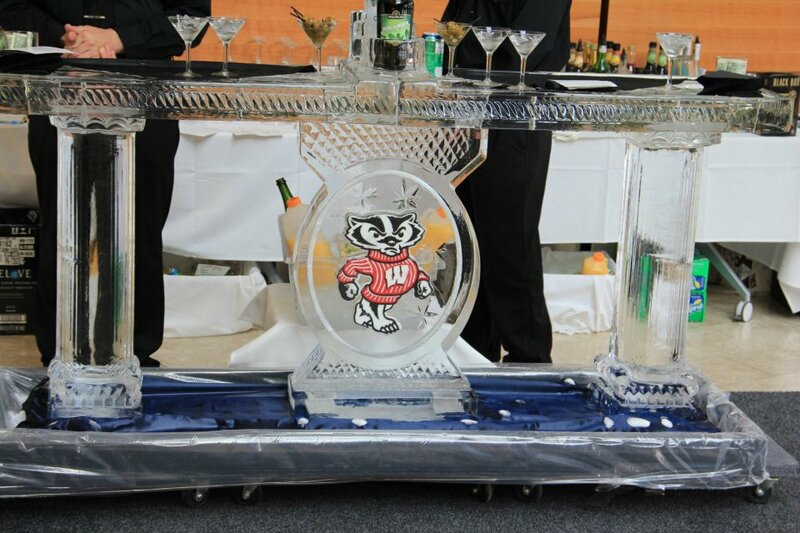 Usually clients ordering an ice luge have a person who will serve a “Signature Drink” with their ice luge. Patrons are supplied with a glass and the bartender or server pours the special signature drink through the luge. The signature drink is then cool once it’s ready for your guests catch the drink with their glass. 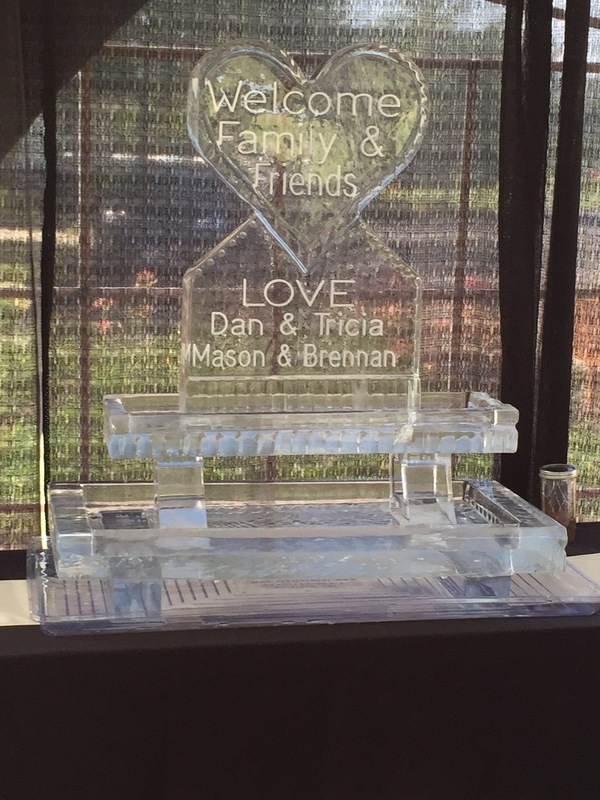 Another fun piece that will truly differentiate your wedding is an Ice Bar. Ice Bars are for those of sophistication. These are usually 4-5 block settings. There is a set-up and take-down component to this type of order. Ultimately though really the coolest of the group. Our last ice sculpture example is a food display. This food display was used for a wedding we did at the Oaks Golf Course in Madison, WI. Our clients served vegetables on each level. This is a multi-block sculpture. Some clients like to display sea food like shrimp in this type of a display. All orders will need a drip tray, set-up and delivery. 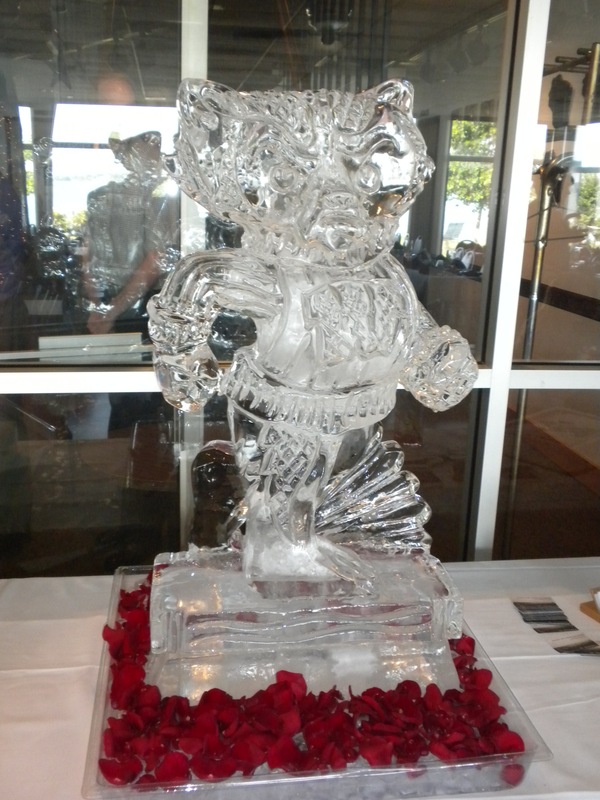 If you hire our entertainment company we can offer you free clean-up of your ice sculpture display. Interested in learning more? Give us a call at 608-320-3554 or email us now at sales@discjockeymagic.com. Madison’s Best DJ – DJ Magic Entertainment. Ranked Top 10 in the state of Wisconsin & Top 500 in the USA. Thousands of brides can’t be wrong, check out their Testimonials now on our web site. We list actual Names, Telephone Numbers & Email Addresses so you can verify your decision to Hire The Best & Forget The Rest!